It was, truly, one of the great mismatched double-bills. Back in 1980, I had gone to see David Lynch's The Elephant Man at, I think, the La Parisien (sic) in Garden City, Michigan. My friends and I decided to stay for the second feature, which turned out to be Hangar 18, the gloriously goofy UFO conspiracy movie from the greatly-missed Sunn Classics, a subsidiary of Schick razors and the folks behind such monuments to American documentary film as The Outer Space Connection (1975), In Search of Noah's Ark (1976), and Beyond and Back (1978). I was completely mesmerized but my friends, in whose car we had ridden, were merely appalled and so about 40 minutes into the picture they pried me from my theater seat and we left. For 33 years I wanted to see how Hangar 18 ends and now, thanks to Olive Films and their splendiferous new high-def release, at last I could. I'm grateful. The movie, turns out, doesn't quite hit the delirious Ed Woodian heights of a Plan 9 from Outer Space, but for those attracted to outre, goofy fare like that, Hangar 18 offers a heaping helping of similar charms. 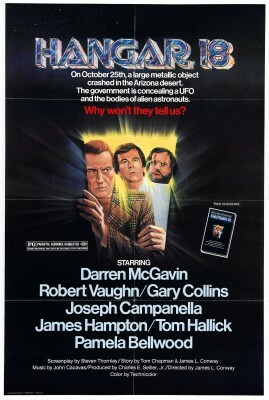 The movie basically draws on Sunn's earlier UFO and conspiracy films, grafting it onto a plot suspiciously similar to Capricorn One, released just two years prior. The Blu-ray looks great but, owing to Paramount's licensing restrictions, there are no extras. The movie opens with a Space Shuttle mission, Hangar 18 premiering nearly a year before the first actual shuttle missions. (The film does include experimental free flight footage of the Enterprise, however; that craft never went into orbit.) Astronauts Steve Bancroft (Gary Collins), Lew Price (James Hampton), and Judd Gates (J.R. Clark) are preparing to launch a satellite when they pick up a bogey on their radar skiddling about with the frantic randomness of Pac-Man. Foolishly, neither they nor NASA personnel in Houston, also picking up the blip, including Lt. General Frank Morrison (Philip Abbott) and NASA Deputy Director Harry Forbes (Darren McGavin, channeling Carl Kolchak and sporting a boot brush toupee), halt the countdown, and against impossible odds the fired-up satellite collides with the UFO some distance away. There's a huge explosion, astronaut Gates is ghoulishly decapitated, and the flying saucer makes a controlled crash landing in Bannon County, Texas. White House Chief of Staff Gordon Cain (Robert Vaughn), conspires with Gen. Morrison and Frank Lafferty (Joseph Campanella), concerned that President Duncan Taylor, campaigning for a second-term with the election but two weeks away, could suffer politically if word of the saucer landing were made public. President Taylor, it seems, had ridiculed his opponent's claim to having once seen a UFO. Fearing a bona fide October Surprise, Cain orders the saucer moved to Hangar 18, the Wright-Patterson Air Force Base hangar allegedly also housing the Roswell UFO remains. Forbes is ordered to examine the craft. "Check it out, Harry," Morrison wearily orders. "Top to bottom, inside and out!" In a supremely stupid move, Cain opts not only to leave the two surviving, high-profile astronauts completely out of the loop while erasing all records of the UFO's telemetry, he leaks to the press false accusations blaming them for Gates's death and the loss the expensive satellite. Eager to clear their names, Bancroft and Price play amateur detective, gradually closing in on Hangar 18 while Forbes and his team pry open the craft and take a look-see inside. Lacking any foresight, Cain and his collaborators decide their only option is to send assassins after the snooping astronauts before they reach the UFO, taking even more extreme actions before the picture is over. None of this makes any sense at all. Why exclude the two astronauts from Forbes's team investigating the UFO? Why make the astronauts fall guys? The UFO scenes in Hangar 18 seem to be taking place over the several days immediately following its crash, yet before the shuttle's engines have even cooled NASA already seems to have concluded its investigation on the incident. Further, shuttle launches were big news in 1980 yet the tragic death of an American astronaut, the first since 1967, gets no play at all. Why aren't Bancroft and Price busy speaking at press conferences, offering testimony of their own, and attending memorials for their fallen comrade? And, for that matter, while sleuthing, why aren't these internationally famous astronauts recognized more often? The picture has a good ensemble cast of character actors. Collins is a bit stiff but Hampton, prominent in â€˜70s films like The Longest Yard, has a good ol' boy charm reminiscent of James Garner. (Hampton guest-starred on one Rockford Files episode, but I'd always hoped someone would cast him as Garner's kid brother.) Also in the cast are William Schallert, Pamela Bellwood and Steven Keats as scientists, Cliff Osmond as a county sheriff, H.M. Wynant as a menacing government official, and busy TV commercial and infomercial face Stuart Pankin as a local witness to the crash. The film had a big budget by Sunn Classics standards, probably in the $4-5 million range, but one very modest compared to the usual big studio production. (Up to then Sunn made its money "four-walling" their products, i.e., self-distributing their movies renting movie houses and pocketing the receipts.) As such, Hangar 18 offers special effects that even in 1980 were laughably primitive. Most of the visual effects don't look terrible per se; the problem is they're limited to stationary mattes, rudimentary miniatures and the like, effects dating back to the earliest silent films, and the kind of thing the emerging Industrial Light & Magic were fast rendering obsolete. In 1.85:1 format, Hangar 18 looks great in high-definition, the sharp image bringing out all manner of detail with accurate color, strong blacks and good contrast. The DTS-HD Master Audio, in its original mono, English only with no subtitle options, is also excellent. No Extra Features, sorry to say, owing to Olive's licensing agreement with Paramount. A pity, as I'm curious about the film's production, advertising, and a TV version with an alternate ending, known as Invasion Force. Shrewdly aware there's an audience for entertainingly awful movies like this, Olive Film's Hangar 18 is a fun, unexpected release. Here's hoping they will find room on its release schedule for other Sunn Classics titles in the near future. For fans of such pictures, this comes Highly Recommended. Stuart Galbraith IV is a Kyoto-based film historian whose work includes film history books, DVD and Blu-ray audio commentaries and special features. Visit Stuart's Cine Blogarama here.